The gun must be broken in. A minimum of 200 rounds has to cycle through this pistol before you begin to get some reliability with hardball ammo. Before the break-in period was complete I was experiencing jams with every magazine I put through the gun. I bought Chip McCormick mags thinking that they might provide more positive feeding, but the result was pretty much the same. However, as I approached and passed 200 rounds the gun began to be much more reliable. Today I took the gun to the range and did some rapid-fire 6-round bursts, double-taps, etc. and was quite pleased with the performance of the gun. I put two magazines of Remington Golden Saber HP’s through the gun without any trouble. I personally feel that the .45 hardball round is enough of a stopper without taking a chance on HP ammo that may not be suited to the gun, so I don’t run HP through this particular pistol. At least, not yet. Some advice to anyone buying this gun: Due to the lightweight alloy frame and short barrel, the gun has pretty stiff recoil and muzzle flip. Be sure to hold the gun firmly, and don’t let your grip hand ride up on the grips or you will experience “limp-wrist” jamming and you may accidentally engage the safety. I have learned by experience to avoid these issues. Also, keep your gun well-lubricated. It seems that the changes in geometry caused by downsizing a 1911 make almost all of the tolerances of this gun more critical. It is definitely not very forgiving of maintenance and proper shooting technique. That being said, the gun is now quite dependable given good ammo and proper shooting habits. I took this gun to the range last weekend. I also took my accurized M1991A1. Shooting at fixed targets at 40 feet there was no comparison… my full sized Colt shot one-hole groups off sandbag rests. The Springfield shot a bit low, although grouping was good… 3″ to 4″ at 40 feet off sandbags. 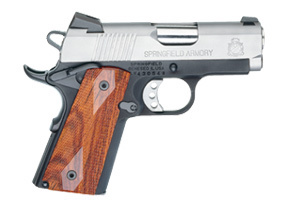 Remember… this is a carry weapon designed to deliver maximum punch at close range. Q: What do you think about the “Internal Locking System” (ILS)? A: I prefer to ignore the “Integrated Locking System”. Springfield provides a plastic key to manipulate this system. I prefer to think that it isn’t there. As far as engineering, manufacture, fit and finish… this gun is a gem. If you get the chance, pick one up and check it out. With all the “Loaded” goodies on it is quite a specimen. Trigger Pull: 5 to 6 lbs.